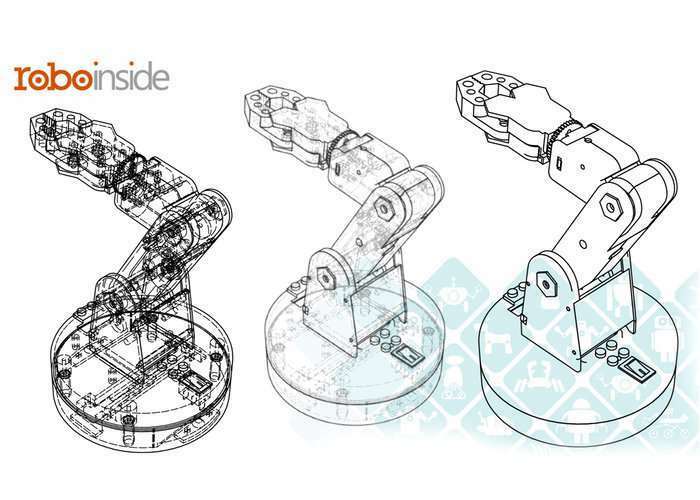 RoboInside has created a new DIY robotic arm which has been specifically created for educational and recreational applications allowing you to learn more about robotics using the robot arm powered by six motors and are quick with Bluetooth technology. The DIY robotic arm can be programmed using block programming systems and is now available to back via Kickstarter with pledges starting at $40 and shipping expected to take place during November 2017, making sure orders arrive before the holiday season. Smart Mini-arm is a robot arm that contains six motors, two chips, two sheets of plastic template, and other components such as screws, gears, and DuPont wires. Why “Smart Club”? STEM and STEAM education approach is globally well-known. For our robot lab, we replaced “E” with “r”, standing for “robot”. We limit the range of engineering to robotics to represent our educational approach. Therefore, Smart club to us is Science, Math, Art and Artificial intelligence, robots, and technology. Mini-arm has very high educational values. Our instruction starts from how to strip wires, wrap around the motors, all the way to writing a control program on MIT APP Inventor, which is an online app writer. We assume that you know nothing about technology, so we try to include as detailed instructions as possible. However, if you do have previous knowledges, you can always skip ahead. When we made some samples of the robot kit, we hosted a small class and received very positive responses from the children and their parents. There’s no recommendation of age for Mini-arm, because we encourage all age groups to learn robotics. For more information and to order your very own DIY robotic arm jump over to the official Kickstarter campaign page by using the link below.